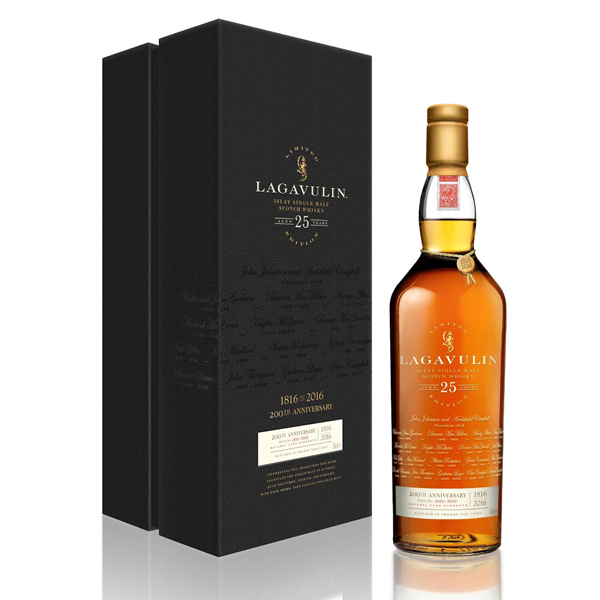 Lagavulin celebrates its bicentennial year in 2016, and the height of its celebrations has got to be the release of a limited edition 25 Year Old. One of Islay’s beloved whiskies, it even features heavily in pop culture. John Mayer once stipulated the Lagavulin 16 as a necessity in his hotel contract rider. Johnny Depp is on the wagon but says he occasionally orders one so he can nose the whisky. Ron Swanson — sorry, Nick Offerman — calls it “mother’s milk” and genuinely loves the stuff, so much so you can watch him quaff it slowly for 45 minutes on Youtube. The much-revered distillery kicked off its celebrations earlier this year with a limited run 8 Year Old expression. As a grand finale, Diageo has released a 25 Year Old 200th Anniversary Limited Edition bottling. Dr Nick Morgan, Diageo’s Head of Whisky Outreach calls it “a sublime expression of Lagavulin”, adding that he couldn’t think of a better way to pay homage to the distillery managers. Of the limited run of 8,000 bottles, only 96 bottles have made their way to Singapore, and will only be available through Diageo’s Private Client service at the Johnnie Walker House Singapore with a price tag of S$1,820. Located within the Diageo office, the Johnnie Walker House Singapore is a by-invitation-only private suite that is a window to bespoke Scotch Whisky experiences, in-depth conversations and a veritable treasure trove of the rarest Scotch Whisky ever produced by Diageo. Appearance Deep, red-hued chestnut. Slow, lingering. Nose Profound, complex and dry overall. Rich yet elusive, it really takes time to open up, first offering liquid dried fruits; figs, dates or prunes, a trace of treacle toffee with almost no sweetness and a distant faintly medicinal note of wood polish, which takes on char and smoke, as with a fine old oak chest left too close to a roaring fire. Gradually you discover jammy notes with roasted meats and honey; even, a raspberry coulis. Finally, there are clean ripe red apples, mint and, in time, a whiff of sealing wax. Water brings up soft toffee and milk chocolate, sweet marzipan over sour cherries, cold smoke, burnt timbers and pine resin. Palate A voluptuous, oily texture, with a bitter-sweet and gingery, slightly drying start. Intense, with masses of charred wood, oak-smoked meats, honey, burnt treacle tart and ash. Then, refreshing spearmint. Salty, then sweet, with water; gentle peat and spearmint. Now it’s soft, comforting and relaxed. Finish Long, smooth, sweetly honeyed and elegant, with slowly rising fragrant wood smoke, ash, salt and a subtle, chilli-like heat; followed by cooling eucalyptus. Finally, oily and bittersweet, with burnt orange peel, all of it lingering deliciously. Softer with water, which brings a late, quiet pungency.